PRICE INCLUDES OVERNIGHT DELIVERY: Everything you need to make genuine Philly Cheese Steaks right in your own kitchen. 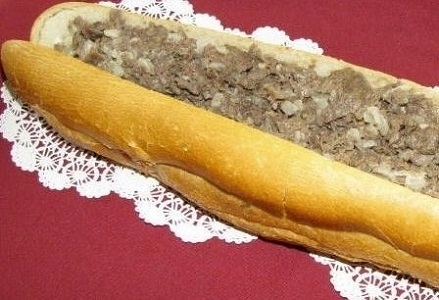 Package includes 10 pounds (20 half-pound portions) of frozen Philly Sandwich Steaks, 20 genuine Amoroso steak rolls and a supply of sliced white American cheese. You receive the entire package via overnight air. Keep some out for immediate use and freeze the rest to satisfy those future urges for a "Real Philly Cheese Steak". For those of us that grew up around Phila. and move away, it like taking a trip home without the traveling. Excellent quality and service. Authentic Philly Cheesesteaks just as I remember from living in the area many years ago. Outstanding customer service, meat quality, and freshness of the Italian Amoroso rolls shipped via overnite air, carefully packed to maintain best quality. We ordered these for the Super Bowl. Followed the instructions and froze everything when it arrived. The rolls tasted fresh and amazing when defrosted, and the meat was easy to cook from frozen. The cheesesteaks were a huge hit! Every few years we order the 20-pak. Nothing like it here in California. The rolls, the meat, the cheese and the instructions are just divine. Thanks! These steaks are so tastey! The entire order arrived in just a couple days of placing the order. Everything was fresh & delicious. Almost like being on Philly.